Bethesda has opened the next entry in The Elder Scrolls series – The Elder Scrolls: Blades – to Early Access with some players getting an email invitation to download the game. In case you missed the game’s debut at E3, Blades is a mobile version of The Elder Scrolls games and offers real-time combat, dungeon exploration and even a new city-building mechanic. 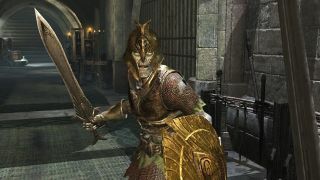 The game follows Bethesda’s success with the mobile (and later console) Fallout Shelter while still sticking true to the The Elder Scrolls series’ roots. According to the FAQ on Bethesda’s website, any progress made during Early Access will carry over to the main game, as will any in-game purchases you make. The Elder Scrolls: Blades is available for free on iOS and Android in six languages starting from March 28 – at least, according to the App Store. That said, you can still sign up for Early Access on Bethesda’s website or via the Google Play Store to try and sneak in a day early.